classification or types of mold injection very depend on what we need to make the plastic parts, because every parts have specific and unique design. when design molds we must see what the influencing factor like geometry, number of cavities, ejection principle, plastic material and shape of parts. 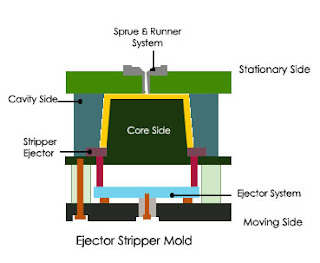 the standard mold is the most simple design, basically the standard molds is same as two plate molds construction, they divided in two side : cavity side and core side, cavity side is the side that construct to flowing plastic material from nozzle to cavity parts, basically they consist of sprue, runner. core side construct to make shape for core, demolding system and ejection system, at this side we design ejection system. 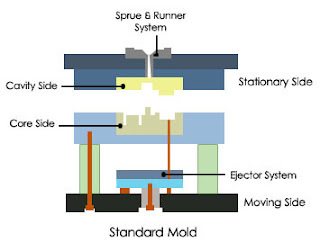 standard mold have one parting line, and have one opening direction. 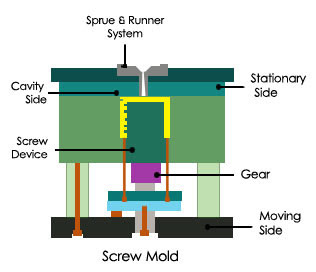 this type of mold use in all kinds of plastic parts that doesn't have undercut, inner and outer screw. Light brown color little and straight in ejection system is shown ejector pin. 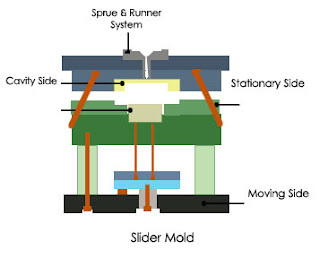 development from this mold type is the used slider parts in various molds types, basic slide mold is transfer horizontal movement of mold to vertical movement, this types of molds is used to make parts with undercut, you should see more at the post when we need slider for learn more. basically three plate molds has two parting line, and floating plate, floating plate support by support pin, Since the mold has two parting planes, the runner system can be located on one side of floating plate or make special plate that attach in floating plate, we called runner plate, see post about runner plate. 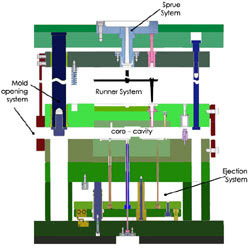 Three plate molds are used because of their flexibility in gating location. this types of molds is flexible even use in multiple cavity. 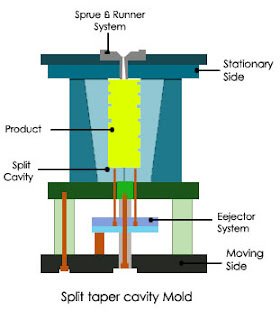 basically the split cavity is same as 2 plate standard mold, but the cavity have split block to make undercut product or external threads. this type of mold use when the slider is not enough to make the undercut or the threads. the disadvantages of this mold is when use for little parts, the construction will difficult. this mold special to make thread forming, the core can be rotate when demolding process, both internal or external threads can be forming by this type mold. from those picture we can see that they have gear device, the gear will rotate when form thread. Molds with complex and difficult design can be integrated or combined one to the others mold type. Please help me. My problem is the surface of my moulding is not smooth.There is a little part very roughly so that the result of pipe pipe is not smooth. Your post will help customers to know about Plastic Moulding.PET Preform Molding concentrate on the quality, shape and size of the products. This is noticeable points, I can never forget this information, and this is good. Thanks for your valuable information.I found it very useful.Keep posting amazing content like this.